Welcome to our blog about your brain! 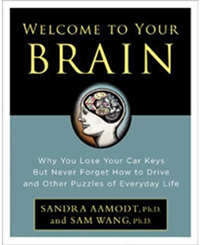 Here Sam and I will update you on events and publications related to our upcoming book, Welcome to Your Brain: Why You Lose Your Car Keys But Never Forget How to Drive and Other Puzzles of Everyday Life. Our first move was an op-ed in Thursday's New York Times. In it, we explained that when it comes to maintaining brain function, there's nothing like physical exercise. The piece has been very popular - it was the #1 most-emailed article for three days, and is still the #1 most-emailed for the last seven days, and #3 most-emailed for the last thirty days. Go read it. [PDF (2 MB)] Then turn off your computer and go for a walk. We also did an interview with Joy Cardin of Wisconsin Public Radio this morning. That was fun, except for the part about having to get up at 3:30 in the morning (California time) to go live. Luckily, questions from Joy and the callers woke us up. Update, November 23rd: We've hit #1 most-emailed for the last thirty days! December 7th: Our article is finally displaced to the #2 spot - by another brain/mind article, on the subject of perfectionism. On page 30 you list two scenarios for which you predict whether it should easier for people to accommodate to flying east or west, depending on the length of their personal biological clock. I happen to be more of a "night owl" than anyone else I have ever known in my 73 yrs. of age. I would probably function "normally" if the earth's period of rotation were 30 hours. 1. I am most awake in the evening. 2. it is harder for me to adjust to eastward travel. My thinking may be messed up, but I think that most if not all people with circadian periods more than 24 hours would answer as I have. In summary: I think your answer for the night owls should be: 1) b, 2)b instead of 1)b, 2)a. If I'm wrong, somebody please explain why. Jet lag for different circadian patterns: an addendum to my previous blog. I failed to mention that I think that, although a person with a circadian period of less than 24 hours might have more trouble recovering from travel in either direction (such people are weird in other was as well), the short-period person, should, in principle, have more trouble recovering from westward travel than from eastward. I suspect the direction would depend upon how far in each direction we are talking about. Again, somebody explain why I am wrong, if I am. I'm reading your book and I showed it to a person who doesn't like Scientific Divulgation books... We've just had a discussion about the it though he has not read it... He asked, does it cite any references? I love your book, I wish it had a section for : "further reading"
Thank you for writing. The US paperback edition has a reading list for further exploration.